An astronaut onboard the International Space Station (ISS) shot this photograph of a mining town in the Surat Basin of Queensland, Australia. The basin is made up of 150 million-year-old sediments and contains more than four billion tons of proven thermal coal resources. 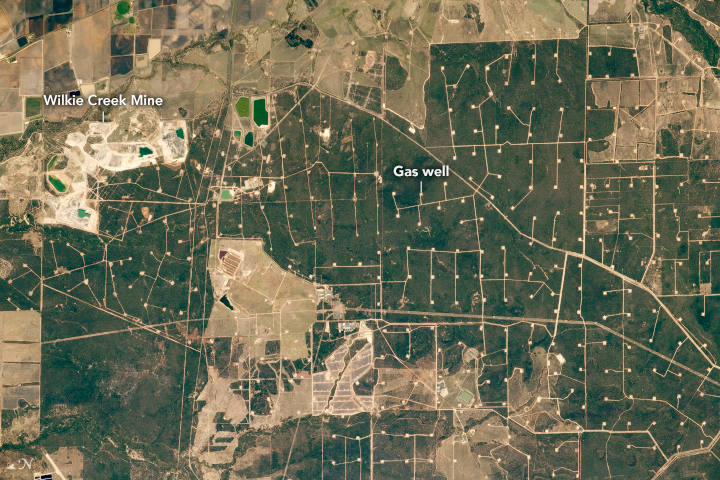 The Wilkie Creek surface mine used to produce low-emission thermal coal. Thermal or “steam” coal is burned to create steam for electricity generation. The deposits in the region contain methane gas, which can present safety risks during mining operations. As a safety precaution, boreholes were drilled from the surface into the deposits to create gas wells, allowing the methane to vent before mining. These gas wells are sprinkled throughout the darker forested areas in the image, where bare squares of land are connected by a grid-like pattern of roads. Due to the decreased demand for coal, mining operations at Wilkie Creek Mine were suspended starting in 2013 after 18 years of coal production. 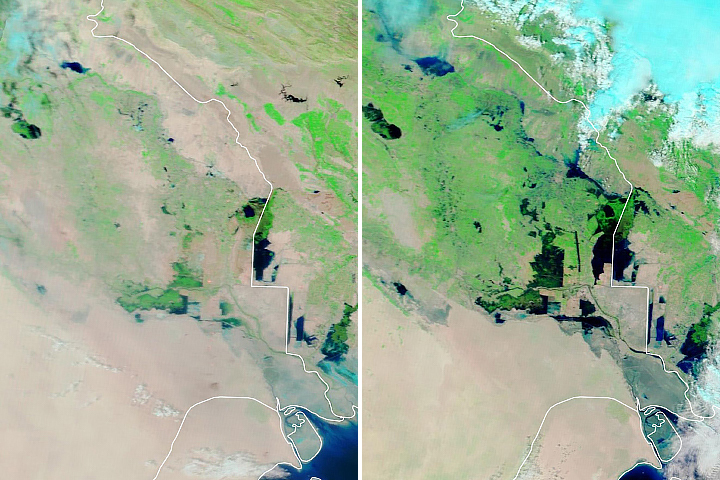 While the man-made surface changes are still visible from space, land rehabilitation efforts are now underway. According to information from Peabody Energy, the project site is being transformed into grazing land for cattle. 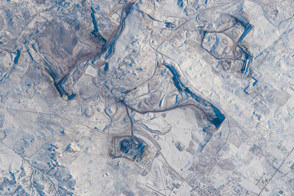 Astronaut photograph ISS057-E-99919 was acquired on November 15, 2018, with a Nikon D5 digital camera using an 800 millimeter lens and is provided by the ISS Crew Earth Observations Facility and the Earth Science and Remote Sensing Unit, Johnson Space Center. 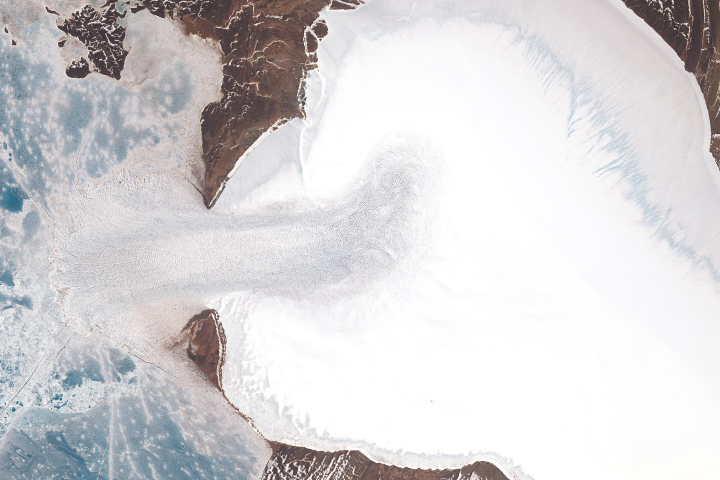 The image was taken by a member of the Expedition 57 crew. The image has been cropped and enhanced to improve contrast, and lens artifacts have been removed. The International Space Station Program supports the laboratory as part of the ISS National Lab to help astronauts take pictures of Earth that will be of the greatest value to scientists and the public, and to make those images freely available on the Internet. Additional images taken by astronauts and cosmonauts can be viewed at the NASA/JSC Gateway to Astronaut Photography of Earth. Caption by Sarah Deitrick, Jacobs, JETS Contract at NASA-JSC. Department of Mines and Energy, Queensland Government (2007) Queenslands world-class coals: Mine Production and Developments.